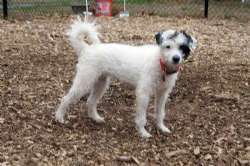 Blossom is a 1 year old Jack-a-Poo (Jack Russell / Poodle mix) who is ADORABLE and so much fun. When excited she can jump into your arms. She is great with women and children, but doesn't seem to like men, so she is not the dog for everyone. She might be best as a one owner dog. We received her from a NJ shelter after Hurricane Sandy. We put her in a foster home with a woman who works as a nannie and she did great. Nannie says: She has been great with the kids. Loves to be pet and have her belly rubbed. She appears to be housebroken. She is doing well with the crate. She will go in fine at night and will go in during the day with coaxing with treats. She has a ton of energy and LOVES to play with squeeky toys and balls of all shapes and size. She could probably fetch for hours (we are still working on leaving the ball but if you have two she will bring one back, drop it and chase the next). She tends to be vocal and will alert you when she sees people or when people first come in the house / if she hears strange noises. She will sit for treats and we are working on sitting quietly before getting food. She has tons of energy and would do best with an active and playful adopter.She plays great with small dogs, but of course like any small dog, she is afraid of some of the bigger dogs. Please fill out an application online or come in to meet her during our visiting hours. 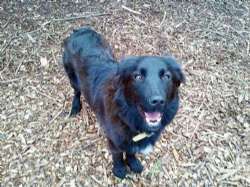 Bonnie is a beautiful Flat-coat Retriever, we think. She is about 9-10 months old, but only weighs 26 lbs, so could be mixed with something smaller. She is spayed. She looks big in the picture but she is a medium sized. She is a great dog, sweet as can be, She was found with Clyde at an abandoned house. She likes to be with you but not on top of you or in your space, if you are busy she will just lay somewhere nearby. She is very quiet and is housetrained with a dog door. She is not a dog to sit home alone while you are at work, however, as she is a young dog who has exercise and training needs. She has not been cat tested but has a gentle temperament so would probably be fine with children or seniors. She is not a dog park dog or a doggy daycare dog as she doesn't like other dogs jumping on her. She has no patience with her side-kick Clyde sometimes. She walks on her leash and rides well in the car. She is available 12/8/12 and will be at Petco Natick from 11-1 PM and at our shelter on Sunday from 12-3 (if she's not spoken for on Sat). Please fill out an application if you are interested in adopting Bonnie. Meet a dog named Boy (yes, you can change his name). 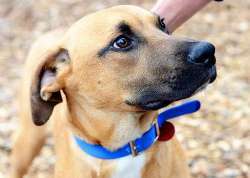 Boy is a very sweet, laid back one year old Lab/Hound mix who was raised with kids. He is a very good boy who rides great in the car. He would love a family. He is great with other dogs, unknown with cats, and he's neutered. He is arriving from WV around the end of December and will be available after a brief quarantine. If you have children, we require a fenced in yard. See our guidelines under http://saveadog.org/applytoadopt.asp. His foster mom says about him: Boy is a very big, very sweet, dog. He is very friendly with everyone and follows the family around to see what is going on. He would love to be up on the couch snuggling,and tries every angle to get there, but we are trying to discourage this. He would love a big soft fluffy bed of his own. He likes to chew his toys and roll around on his back on the living-room rug. He seems to be housetrained and has not had an accident inside. He cried a bit when we crated him at bedtime, but then settled down and slept through the night. He is very tall and can rest his chin on your dining room table or countertop if there is something interesting up there. He has not chewed through anything he should not so far (except for his leash). He is gentle around the kids but tried a jump up on the adults a few times. A very nice dog! He is available as of 12/23. Brutus is a little male who needs our help. His family brought him to an overcrowded shelter to be put to sleep because he and his mate and puppies were "too much work." Brutus is a tiny dog with one leg out of joint. It turns out he broke his leg a year ago and he was never given medical attention. Brutus deserves so much better than this so we are giving him the medical work up that he has been waiting for all this time. Imagine the pain this poor dog has been through. He will eventually be put up for adoption. He weighs 14 lbs. and his little tail never stops wagging. In the photo on the bottom, Brutus is pictured on the right, with his mate on the left. UPDATE: Brutus has had a full work up of his leg and as he has a little hip dysplasia on his left hip, the vet opted to leave the bad leg since he seems to have adapted to walking on it and is not in any pain. She kept him overnight and did the neuter and pulled a broken tooth. Poor little guy has had a rough life but will soon be somebody's baby. Thanks for donating to help with his medical expenses. 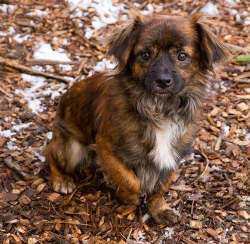 Callan is a 15# neutered male Tibetan Spaniel who came in from the Virgin Islands (St. Croix) where adoptions are very low and euthanasia rates are high. He came from a home where there were too many animals so he was given up. He seems to be completely housebroken. He loves squeaky toys, will chase a ball. He leaps straight up in the air to pounce on a toy. If you are interested in this dog, please express your interest by email (if you have an application already on file) or by filling out the online application under Apply to Adopt. It only takes five minutes to fill out and it helps us to speed the adoption process. There is no obligation to adopt until you meet the dog. The application gives us a nice picture of who you are and helps us to make the right match. Once you fill out the application you can apply it to other dogs as well. 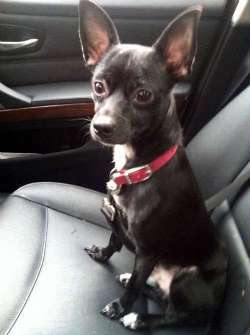 Chica is a 3 year old, female Chihuahua is the most perfect little dog. She is a LOVE! Chica is a sweet girl who loves being a lap dog! She would prefer a nice lap to cuddle on or arms that will hold her close! She likes to be a lap dog, but also likes to go for walks, and play with the other dogs. She does better with dogs her size, she can be to bossy with some dogs smaller than her, although it's hard to find a dog smaller than Chica. She's a tiny mite. The picture of her next to the crate is of a small crate. She is a cute dog. She is playful when tossing a ball around or playing with her toys, yet she is housebroken and does her business outside. She's an easy dog to have. Her history: It appears that Chica was running in the country for quite some time when she was brought in. She is now ready for a warm loving home! Chica weighs around 9 lbs and is will be at the Petco Natick Meet and Greet on Saturday from 11-1 and also at the shelter on Sunday if she has appellations. She's very well behaved in her foster home and is so glad to be out of the shelter. Please apply before we get too attached to this little love bunny. Please fill out an application online if you would like to speed the adoption process. We have visiting hours on Saturdays and Sundays and sometimes mobile adoptions, so please check the Web site for hours. 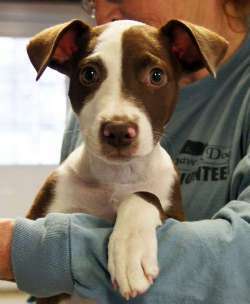 She will be at Petco Natick on Sat 12/8 from 11-1 PM. Come see before someone else snatches her up. 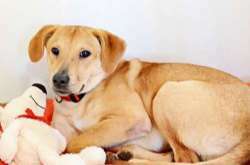 Clyde is a beautiful, ~ 8 month old neutered male Retriever mix. He weighs 46 lbs already so he will be a big boy. He is a great dog who is very submissive with other dogs. He was found running around in an empty house with Bonnie, At the time he had an injury to his upper front leg but it has healed now. He loves to play with Bonnie and Rodger all day and plays with small dogs as well. He is house trained with a dog door. He will walk on leash and rides well in the car. He is very social and needs a wonderful family who will love him. Due to his size he may need a dog experienced family (one who has successfully taken a dog through obedience training and is experienced with handling large breed dogs). He is available 12/8/12 and will be at Petco Natick from 11-1 PM and at our shelter on Sunday from 12-3 (if he's not spoken for on Sat). Please fill out an application if you are interested in adopting him. 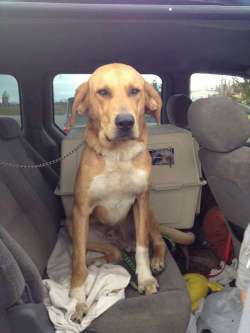 Cody is a 4 year old small male Lab who enjoys the company of people. He weighs 42 pounds and is neutered. He loves attention and loves to be petted. He can tolerate some crating but we think he's also housebroken. He is not a marker. We're not sure how he would do staying home during the day because he loves being with you. He has medium energy. He likes toys, but will destroy a stuffed animal. He will be flown here on 12/12/12 and after his vet visit on 12/14/12 he will be shown on 12/15. An online application will help speed the process and if you already have an application on file and would like to meet him, please send an email to adoptions@saveadog.org. Colin is an adorably playful, gentle 3 month old large breed puppy. 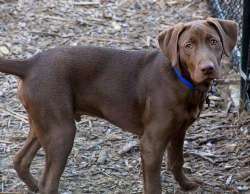 He is estimated to be part Great Pyrennes, part Lab. Like his brother, Sam, he loves toys, playing and romping along the water’s edge. They both chase cats, so no kitties. He is smart and doing well with house training, is learning the leash, but hasn’t mastered it yet, so has to be carried if you want to go somewhere with him. He has a short slick shiny coat and big happy eyes; he likes to be among the big dogs and has lots of interest in the water and exploring his surroundings. Colin gets a bit car sick so maybe with lots of short trips he will overcome this. He is so lovable and waiting for the forever family he will call his own. He would love to have his forever family before the holidays. History: Sam and Colin are two Great Pyrennes puppies who were found by the side of the road in Indiana. Sadly enough, Colin and his brother Sam were left to fend for themselves on a cold, rainy night. Lucky for them a rescuer saw them, picked them up, and took them home. They were wet, muddy, cold, hungry and scared. The look in their eyes when they realized someone was showing them kindness was unforgettable. They ran to the woman as fast as their little legs could carry them and waited until they were picked up and placed inside the warm car. They have been the most enjoyable puppies and deserve a home filled with all they never had in the beginning of their young lives. If you already have an application with us, please just send an email to adoptions@saveadog.org. If you don’t have an application already, then it’s best to fill it out before you lose out. These pups will be shown on 12/15 and if not spoken for, then also on 12/16. Hours on weekends are 12-3 PM. Cooper, ~ 9 months Male Plott Hound Mix. 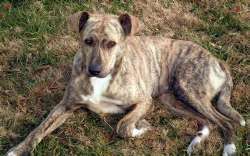 Cooper is a gorgeous honey colored brindle Plott Hound pup that is looking for a home big on love. This special boy was abandoned and when his foster parents found him, he was very malnourished. Cooper was taking care of another abandoned puppy (Darcy) and refused to leave his side. He wouldn’t even eat until Darcy ate first. Now a completely inside dog, he is 100% house trained (would never dream of peeing in the house), walks well on a leash and knows how to sit and stay. He loves to spread out with a favorite rope toy or chew and snuggle. Cooper is a gentle, quiet pup that wants to please so bad his whole body wags with gusto. He’s still a youngster and needs kindness and lots of positive reinforcement. He gets along with all sizes of dogs and loves to play with cats and kittens. He would do best in a home that doesn’t have an overly dominant dog, as he’s super easy going and still developing his own personality. Even though he’s fairly mild energy he needs daily exercise where he can get outside to run and play. This breed is very loyal and sensitive and needs to have a strong connection and stable home to thrive. 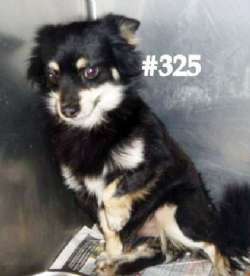 He would not do well in a home where he was left alone a lot because he thrives on companionship. If you are interested in Cooper, please express your interest by email (if you have an application already on file) or by filling out the online application under Apply to Adopt. It only takes five minutes to fill out and it helps us to speed the adoption process. There is no obligation to adopt until you meet the dog. The application gives us a nice picture of who you are and helps us to make the right match. Once you fill out the application you can apply it to other dogs as well. He will be available at our Meet and Greet at Petco 11-1 PM on Sat, 12/8. Dee Dee is a new arrival who appears to have some Lab and possibly some Beagle in her. She arrived at the shelter very scared. She came from a very over-crowded animal shelter in St. Thomas and a kind traveler brought her to Save A Dog for a chance at adoption. She will blossom over the next few days and will be ready for her new home by the holidays. Her previous caretakers write: Dee Dee is a bit of a shy girl but she has a heart as big as all outdoors. She's never met a dog she didn't like. She would be a great pal for another dog. She walks well on leash and never pulls. She's working on house training and with consistency will have no problem. She's a soulful, special dog with absolutely no aggression in her, even when she's frightened. Please fill out an application on our Web site to speed the process. We also have drop-in hours on Sat and Sun from 12-3, but still require the application. This is Dually.He was born on 9/18/12. 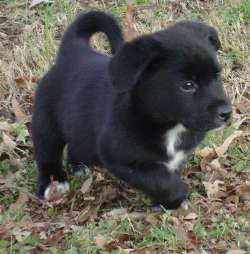 Dually weighs around 7-8 lbs, is 12 weeks old and is tiny, but has a very solid stocky little body with short legs. He is glossy black with a little white on his chest and feet. He is a little love and has tons of personality. He plays all day with his siblings but manages to get in naps through out the day. He is very handsome. His pictures don't do him justice. He loves to have attention and be held, and is learning house training along with his litter mates. A dog door to a fenced in yard is the greatest invention. Please apply online if you are interested in adopting him and please understand that puppies require time (someone home) and training (puppy Kindergarden and basic obedience are required). He is available 12/8/12 and will be at Petco Natick from 11-1 PM and at our shelter on Sunday from 12-3 (if he's not spoken for on Sat). Please fill out an application if you are interested in adopting him. 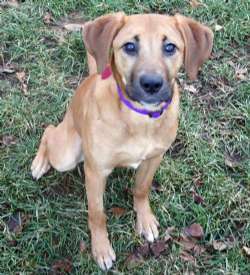 Ellie is a sweet Boxer mix who was dropped over a 6 ft. outside kennel and dumped at a Vet Clinic in Indiana. She is 5.5 months old. The Vet Clinic spayed and vaccinated and released her to rescue. She is crate trained but not beyond 4 hours (she will start crying when she needs to go outside if she is in her crate); she looks at you for praise when she does all her business outside. She loves to play ball. 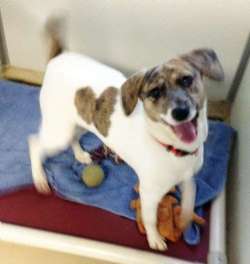 She is a fun loving, playful dog who walks well on leash and gets along well with other dogs. She loves to chase and be chased. She's great in the car, great on leash, sweet with children (older ones preferable), plays tug, is respectful, gives kisses, not nippy. She will be available after December 4th. Please fill out an application if you are interested in adopting her and want to meet her earlier. Fiona is just the most precious little Chinese Crested dog. She is deaf but not disabled. She knows at least 10 hand signals and is very smart. You wouldn't even know she was deaf. She is so sweet and is a real cuddle bunny! 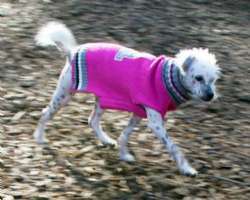 She is a hairless Chinese Crested, a much sought-after yet misunderstood breed. Chinese Cresteds need warmth so if you are trying to save on heating bills, she is not the dog for you. 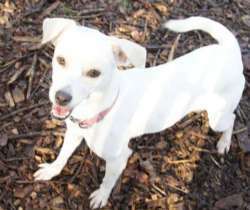 She would do best with another dog as a companion as she picks up on their cues and also loves to play. She really wants to learn more too! She would be a great apartment dog as she is little and is pee pad trained. She is a very smart dog and so very badly wants to learn! 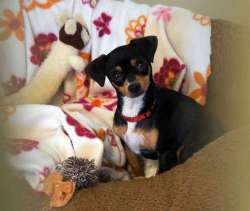 She loves to ride in the car, loves going for walks, and just love to play with other small dogs in her foster home. She sleeps in bed with her foster mom at night. She sleeps buried under the blankets and never moves until she gets up in the morning. She likes to cuddle up with other dogs too. She plays all day and takes naps by the heating vents as she loves the warmth. She needs a draft-free toasty warm place. Her current foster mom lives in an apartment and says: Fiona is such an easy girl to take care of. As soon as we got home, I put down puppy pads, and she went on them every time, not one accident. She's not clingy, but likes to be near me. She will go play with her toys and she loved exploring the house. Her personality is amazingly sweet. I'm so glad I took her home. 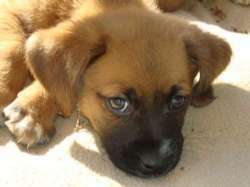 If you are interested, please fill out an online application at http://www.saveadog.com/application.asp. She was just spayed so will not be at the meet and greet during the weekend 12/8 and 12/9. Hagen is a very well behaved, QUIET and TINY, 2 year old spayed female beagle who is available 12/15/12. She is under 13" so very petite. She is the sweetest little girl, according to the vet. She would be great with a family and good with kids. We don't anticipate problems with cats, but she hasn't been tested. She was flown here on an Angel flight on 12/12 and will be available to be seen on 12/15 and 16th from 12-3 at our shelter at 604 Boston Post Road (Rt. 20) in Sudbury, MA. An application online would speed the adoption process. 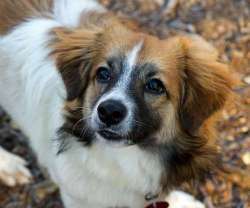 Junebug is a ~1 year old Collie mix who is coming soon along with her puppies, which appear to be mixed with something small. Junebug is not a very big dog herself so could have some Sheltie in her. She weighs 26 lbs. and is full grown. She is spayed. June Bug was a stray who was very very pregnant. Thank goodness some nice people found her as she had a multiple fractured front leg. She had her pups just a couple of days after she was rescued. She was an awesome Mom even with that cast on her front leg. She is healed (after about 10 weeks in the cast) but still has a bit of a limp that only seems noticeable when she is walking but not running, as she loves to play with the other dogs in the foster home. She should get better in time. She is not an alpha dog quite the opposite. She is a sweet and lovable dog she just loves to get and give love. She is calm most of the time laying on her back, but when play time begins she is there! She is a quiet dog, even when she's excited. She is crate trained and has only had a couple of accidents in the house. She seems to be a long coated Shellie mix so there will be shedding. This is a sweet and special little girl of 26 lbs. WE ALREADY HAVE SEVERAL STRONG APPLICATIONS FOR JUNEBUG SO WE WILL NOT BE BRINGING HER TO PETCO ON DEC. 8TH. 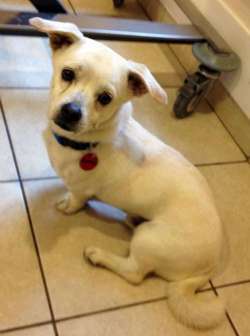 Keebler is a Pom mix tripod with the most easy-going and amazing personality. You would never know what this dog has been through to meet him -- we cannot sing his praises enough. He is around 2 years old. He was pulled from a WV shelter and had an old break that was never taken care of. He was transported into TN and had the injured leg removed. He gets around just fine, you would never know he was a new 3-legged dog. He can handle small sets of stairs with no problem. Keebler is house trained, quiet and mellow. He loves stuffed animals and running in the yard. His foster Mom has two dogs and two kids, ages 11 and 12. He is good with dogs, cats and children. He might be a little too fragile for little kids to lug around. Keebler walks on a leash and loves to go for short walks, he gets tired quickly only having three legs. He sleeps all night long in a crate, he doesn’t make a sound and waits for his foster Mom to come down in the morning to let him out. Once you are friends he will try to talk you into holding him on your lap for hours. He is the biggest snuggler, but he doesn’t demand attention. He is available 12/8/12 and will be at Petco Natick from 11-1 PM and at our shelter on Sunday from 12-3 (if he's not spoken for on Sat). We want to thank Country Canine Dog Daycare in Acton for holding a fund raiser to help with Keebler's expenses. 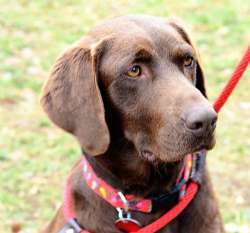 Kendall, ~ 1.5 year Female Chocolate Lab Kendall is a gorgeous chocolate female lab with green/gold eyes. Typical of the breed this big girl is very athletic and yet total coach potato. She is a definite candidate for water sports, she loves the water anytime/any weather and will chase down tennis balls and drop them at your feet. She knows how to sit and lay down, is always up for a car ride, and walks well on a leash if she’s not allowed to pull ahead. 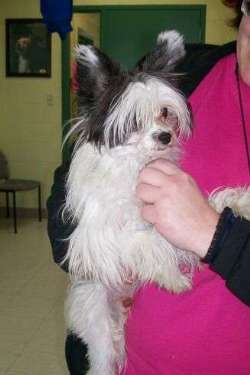 She should have a dog savvy adopter, as her size will require obedience and structure. She is housebroken and will hold all night. Kendall is extremely gentle-natured. She takes food softly from your hand and treats can even be taken away from her. She gets on well with all sizes and breeds of dogs and would have a blast at the dog park. (She doesn’t seem to be bothered by cats but because of her size caution should be used at first). But for all of her love of playing, truly her happiest moments are being near her foster parents. She greets strangers with a happy wag of the tail and would be great with kids. She would not do well left alone for long periods of time, isolated from the family. Kendall has a big heart and definitely needs to be an important part of a family. If you are interested in this dog, please express your interest by email (if you have an application already on file) or by filling out the online application under Apply to Adopt. She is available to be seen on 12/8/12 at Petco Natick from 11-1 PM and at our shelter on Sunday from 12-3 (if not spoken for on Sat). Leroy is a very playful young Beagle boy. He is a SMALL and QUIET one year old Beagle. He was originally a stray in Indiance and taken to a shelter. He was great at the vet visit, handled beautifully and although he can be a little shy at first, he warms up quickly and doesn't seem to have any big issues. Leroy likes to play outside and sometimes he doesn't like to come in so if you adopt him, he would do best in a fenced in yard with a long leash he can drag so you can get him in easily. He can play by himself inside and doesn't bug you -- he will play with his toys. He weighs 17 pounds, walks well on leash, and is working on house training. He is a small dog so needs more outings for bathroom breaks than a large dog. He is being flown here on 12/12 and will be available to be seen on 12/15 and 16th from 12-3 at our shelter at 604 Boston Post Road (Rt. 20) in Sudbury, MA. An application online would speed the adoption process. Mercedes is a 13 month old fluff ball who needs a great home. She is smaller than Junebug, who just got adopted. She came from St. Thomas where there is an abundance of puppies and nice dogs for adoption. If you plan your warmer weather excursion, please go to St. Thomas and go to the shelter as they are full right now beyond capacity. 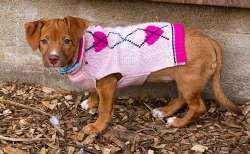 You can offer to give a pup a ride to Boston or even adopt. Mimi is an adorably sweet, teacup Chihuahua who was abandoned along with her sister, Mitzi, at an animal shelter in St. Thomas. They were flown here as their only hope of adoption. Mimi is black and tan while her sister, Mitzi, is all black. We'd like to place them separately unless going to a very dog savvy home. They are darling and very sweet little lap dogs who also like to play. 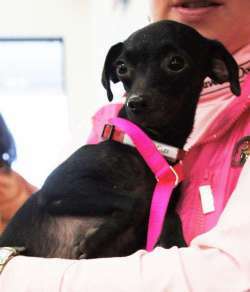 Mitzi is an adorably sweet, teacup Chihuahua who was abandoned along with her sister, Mimi, at an animal shelter in St. Thomas. They were flown here as their only hope of adoption. Mitzi is all black and her sister, Mimi, is black and tan. We'd like to place them separately unless going to a very dog savvy home. They are darling and very sweet little lap dogs who also like to play. Meet "Paco"! 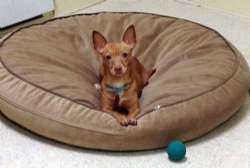 He is an ADORABLE tiny Chihuahua / Boston mix male who was a local stray. He loves sitting on your lap, getting pets. His foster mom says he is a joy to have and he has taken to sitting in her husband's lap watching TV and taking a nap. What a little love bug. The right person is going to come along and fall in love. He was recently neutered 11/29/12 but has bounced back so quickly you would never know. He's curious and generally a happy boy. He is available and we would love to have you fill out an application as he is in a foster home and we can bring him out to meet you at the shelter once we know that he has interest. Thanks so much!! Please fill out an application if you are interested in adopting him. 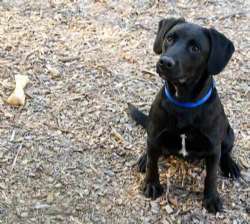 Pam is a tiny Labby-looking dog who is 2 years old and in need of a great home. She waves her little paws at you when she's excited. She is darling in every way. She came in with her pal, Dew. She came here from the St. Thomas Humane Society where there is a huge pet over population. She is a cute dog, weighs around 20 lbs., and loves to run around and play. She and Dew are called the Dancing Dogs because of the way they prance around on their hind legs. They are getting spayed on 12/4/12. Her pictures don't do her justice. If you are interested, come down and meet her at our shelter during visiting hours. Filling out an application ahead of time helps us to speed the process. 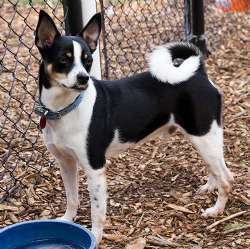 Pepe is a two year old Rat Terrier mix who seems to have some Basenji (honey bun tail). He came here from the St. Thomas Humane Society where there the shelter there is overly packed with dogs. Pearl is his side-kick, but can be adopted separately. They might be brother and sister. Pepe is 24 lbs. and is neutered. He is SUPER friendly and SWEET! He is great with kids, so mellow. He is fostered with children ages 4 to 10 and he's so gentle with them. He is ready to go home anytime! He is almost finished his kennel cough so can be seen by private appointment now or this weekend Sat 11-1 at Petco Natick. Phoenix is an adorably sweet purebred Chinese Crested puppy who was found -- guess where -- in a West Virgina shelter where dogs are euthanized for space. A friend of Save A Dog learned of it and raced down to get him for Save A Dog, knowing what a Crested-lover Shirley is. Phoenix is the perfect little dog and he was adopted by someone who had adopted a Crested from us years ago, who had since passed. Phoenix is doing great in his new home! 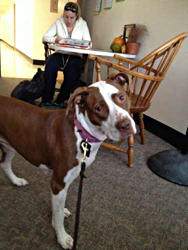 Princess is a beautiful 18 month old female Bully breed mix who has a lot to offer an adopter. She is a really smart dog who has had a lot of training. She is great with other dogs, in fact she lived with a Shih Tzu and has co-existed just fine with a host of dogs of all sizes. She has been recently fostered by one of our veteran volunteers who is a student at U Mass Amherst -- and Princess goes to all classes. As told by her foster: Princess is a FANTASTIC companion, who needs a dog-savy home. This necessity is not based on her being a bully breed, rather it is because of her intelligence. You see the same personality in working shepherds, labs, and goldens- ever loyal and constantly thinking, working to please. For what you put into this dog, she will give it back ten fold. Princess, like all dogs her size and age, needs a lot of exercise. She is a great running companion and will stay close by your heel even off leash. She is polite and playful with dogs, people, and children we encounter on walks through the neighborhood, on the beach, and in the woods. She'll greet you with a toy at the door, or wiggle with it in her crate, making you think she's been in there the entire time you were gone. She eats and sleeps in her crate without a fuss, and will readily run in on command. She also knows basic obedience skills, polite leash walking, and rides well in the car. She settles down to sleep in the backseat on long car rides and is a great errand buddy. She comes to class with me at the university every day, sleeping through lectures, research lab meetings, and work in an academic office. She wears a doggie backpack and carries her own water bowl, toys, and bones. She's well socialized, having experienced everything from packed busses to elevators. Princess is not a velcro dog by any means, but likes to stick around you. She's sweet as can be with goofy radar ears and a demeanor that will make you laugh every single day. Please fill out an application and we will be in touch with you within a few days. Apply at www.saveadog.org. 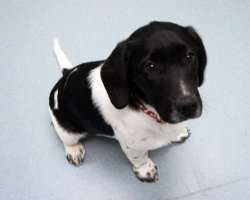 Reese is a 4 month old male Lab puppy who was turned in by his owner who said he was not good with men. So far he's been great with all the men coming and going at the shelter where he's at in Indiana. He is great with young children. He walks well on leash and loves to ride in the car. He needs a stay-at-home family, not a working family, or he would be miserable just sitting in a crate waiting for you to come home on your lunch hour and then after a brief break putting him back in the crate. That just would not work for this pup. Families with young children are required to have a physical fence, no exceptions. Reese will be flown here on Wednesday and have his second health exam on Friday before we put him up for adoption. Please fill out an online application as he will be a very popular dog. 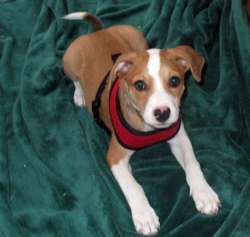 Ricky is an adorably cute and playful Boxer / Beagle / Terrier mix who loves to play with his toys and chew on antlers. His foster mom says: What a good little boy, he's almost trained to go outside - you just have to watch for signs and I've got him on a leash so he's getting use to walking on a leash - he knows what to do once he's outside. Ricky has such an appetite - very good eater (3 times a day) everything looks healthy. He's such a love, like to give kisses. His feet are a big clue to his size and breed - I think the boxer quess is a good one. Puppies need someone home with them during the day and not more than 2 hours alone total according to puppy expert Ian Dunbar. Please be someone who has the time for him. He is too young for doggy daycare. Please fill out an application on our Web site and see our guidelines. He's an adorable pup who deserves a loving family. Available 12/27. Meet Rocky! He is a tiny-sized (7-8 lbs) male pup who is 12 weeks old and just ready to leave his litter mates. He is very happy! He is always very happy; he makes you smile because everything is the most exciting thing ever to him; just your appearance in the room makes him so happy. He looks very much like his brother Dually, but his legs are not so short. He also has less white on his chest. He has been working very hard on his house training and would ask for lots of patience while he learns. He already is figuring out people like it when he goes outside instead of on the floor. He, as all the pups in this litter are well socialized and will bring nothing but joy to the lucky family that adopts any of these pups. He and his litter mates will most likely be available on 12/8/12. Please read our guidelines under Apply to Adopt on the Web site and fill out an application if you'd like to be considered. He is available 12/8/12 and will be at Petco Natick from 11-1 PM and at our shelter on Sunday from 12-3 (if he's not spoken for on Sat). Please fill out an application if you are interested in adopting him. Roger is a six month old Boxer mix who is available for adoption. Roger is a very sweet boy. He came from the shelter and his name was bones because he was so skinny. He runs and plays all day, He walks on a leash, he seems to be house broken with a dog door. Sleeps on a dog bed, loves toys. He loves to play with other dogs. He has learned to not jump on you and will sit to be pet. He is a good boy with lots of potential with someone who has the time to work with him. He would be good with kids, if he is taught to keep his manners! He is available 12/8/12 and will be at Petco Natick from 11-1 PM and at our shelter on Sunday from 12-3 (if he's not spoken for on Sat). Please fill out an application if you are interested in adopting Roger. 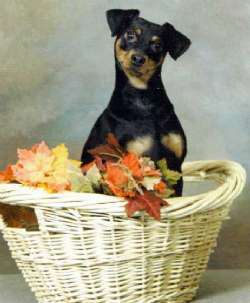 Sadie is a healthy 10 year old spayed female Miniature Pinscher (large size about 20 lbs) who needs a home. Her last caretaker moved to an apartment that can't take pets. Sadie took obedience and agility classes for years. She likes to curl up at the foot of your bed at night and hang out or go for a leisurely walk. She is great with cats, always lived with them and good with other dogs if introductions are not on leash. She would be great for a senior or an adult working home as she loves to be your constant companion. Her current foster home has an 8 year old girl and she is great with her. She's a lovely dog who has just fallen on hard times. Would you please consider filling out an application for her on our Web site. Thank you so much! 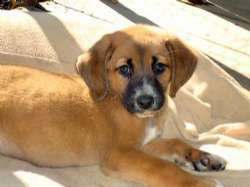 Sam is an adorably playful, gentle 3 month old large breed puppy. 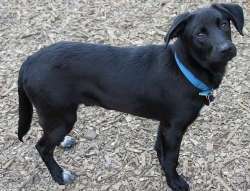 He is estimated to be part Great Pyrennes, part Lab. He loves toys, playmates and romping along the water’s edge. Instead of eating his treats he will scurry off to hide them; who knows if he ever goes back for them! Sam has a fluffy soft coat and the warmest brown eyes. He will make some lucky family a wonderful companion for many years to come. Sam is doing nicely during his time indoors and he shows every indication of being easy and quick to master his house training skills. He does enjoy lots of time outdoors, but likes his naps on a soft doggy bed inside. He would love to have his forever family before the holidays. History: Sam and Colin are two Great Pyrennes puppies who were found by the side of the road in Indiana. Sadly enough Sam and his brother Collin were left to fend for themselves. Lucky for them a rescuer saw them, picked them up, and took them home. They were wet, muddy, cold, hungry and scared. The look in their eyes when they realized someone was showing them kindness was unforgettable. They ran to the woman as fast as their little legs could carry them and waited until they were picked up and placed inside the warm car. They have been the most enjoyable puppies and deserve a home filled with all they never had in the beginning of their young lives. Sam is the longer haired pup and Colin is the short haired. An application will help to speed the process.Sam needs a stay-at-home family, not a working family, or he would be miserable just sitting in a crate waiting for you to come home on your lunch hour and then after a brief break putting him back in the crate. That just would not work for this pup. Families with young children are required to have a physical fence, no exceptions. If you already have an application with us, please just send an email to adoptions@saveadog.org. If you don’t have an application already, then it’s best to fill one out before you lose out. These pups will be shown on 12/15 and if not spoken for, then also on 12/16. Hours on weekends are 12-3 PM. Shea is a sweet, shy female pup who is very petite. She is very shy at first, but comes around when she knows you and then she turns into a lovable, sweet, kind girl. For the right family, she is going to be a very loyal and affectionate dog. Shea deserves a great home. She was dumped in an animal shelter "drop box" along with her mother in St. Thomas. Shea was recently separated from her mother and flown here with the hope of finding a permanent home. Shea needs a lot of love and TLC with an adult adopter or with a gentle, quiet family who has a fenced in yard. You will be her everything from day 1, we can promise. She will settle in quickly if there is another dog in the family, and a nurturing female dog would be her dream come true for this orphan child. You can meet Shea at our shelter at 604 Boston Post Road, Sudbury, MA on Sat and Sun from 12-3 PM (our visiting hours). An application ahead of time helps to speed the process. 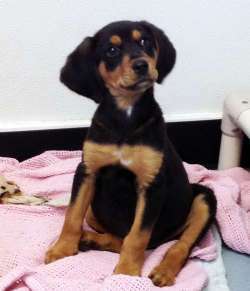 Tari is an adorable 3 month old Beagle/Terrier mix female pup who is spayed already! She came from St. Croix where adoptions are few and there are too many dogs running free with no homes. She is a delightful little girl. If you are interested in this dog, please express your interest by email (if you have an application already on file) or by filling out the online application under Apply to Adopt. It only takes five minutes to fill out and it helps us to speed the adoption process. There is no obligation to adopt until you meet the dog. The application gives us a nice picture of who you are and helps us to make the right match. Once you fill out the application you can apply it to other dogs as well. Tiffany is the only little girl in the litter. She weighs 6-7 lbs. Born on 9/11, she is now approximately 12 weeks old. She is just a snuggle bum; she is the most independent of the litter and thinks her brothers are a real pain. She is the one that will sit on your lap and be pet for as long as you have time. She plays well, but is happy to explore by herself as well. She and her brothers are doing well understanding that it is best to do their business outside. She wiill go on a pee pad if need be. She is very mellow and will need someone to gently teach her everything she should know about being a great dog. She will be available around 12/8/12. We plan to bring her to Petco Natick from 11-1 PM and at our shelter on Sunday from 12-3 (if she's not spoken for on Sat). Please fill out an application if you are interested in adopting her. 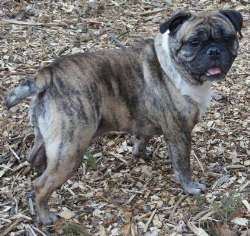 Tito is a 6 year old, neutered male Miniature English Bulldog. His owners are relinquishing him due to health issues. He has been with one owner for four years. He is a sweet, sweet boy. He has never bit, growled or been aggressive towards anyone - or anything. He is great with adults, kids, other dogs and cats. He is obedient, loves walks, rides in the car and just being with people. He is on a prescription diet as he has some allergies. We recommend a raw diet eventually, but for now he is doing very well on the prescription diet and has no visible signs of skin issues. He is used to having a house with a yard, but recently lost that. Since being in the apartment, the owners have been experiencing some health issues that make it extremely difficult to care for Tito. Please fill out the online application if you would like to meet Tito. He is still with his owner, but can be brought to the shelter for you to meet. 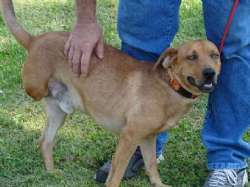 Trace is a 2 year old male "tripod" (3 legged dog). He does not know that he is handicapped so shhhh, don't anyone tell him!. He runs, he plays, he climbs stairs, and nothing slows him down. He loves a little 9 lb. Rat Terrier ( Choo-Choo) who will be coming up soon to be adopted. He will lay on the floor and let Choo-Choo jump all over him. Trace gets along very well with the 3 cats that he lived with while in foster care. If they run, he runs with them and then when they stop he will look at them as if to say ' Why are we stopping? He loves attention ( but is not a nuisance about it). He loves his ears rubbed; when you stop he will gently take your hand in his mouth, like he is asking you to keep going! He's is very gentle! He sleeps on the floor every night on a big fluffy bed. He is house broken with a dog door; he has never torn anything up. He will follow you from room to room and lay down and wait for you to finish whatever you are doing. He loves to ride in the car, but needs help getting in. He gets excited when he sees his leash, but walks are a limited distance....Trace loves to run and play, and loves squeaky toys. We think he deserves a large yard where he can run his heart out! 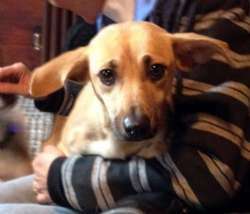 Trace is a victim of abuse, his owner sawed off his leg with a hacksaw when he was about 6 months old. He got tangled in barbed wire, and this was her solution. Trace was turned over to animal control, and he is now a happy dog on his way to Save A Dog. Please fill out an application if you are interested. This is Tuffy, he is about 4 lbs and the smallest of the litter, he has short little legs and big eyes. He can hold his own with the larger pups in the litter, he is so cute, he will sit down and stare at you until you say his name and then he gets excited, he plays until he gets sleepy with his siblings but can entertain himself as well, he loves to be cuddled and will not squirm around. He will most likely be a small dog, but will just melt your heart. 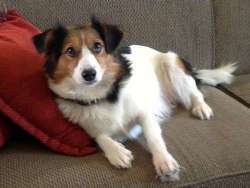 Please apply online if you think you can provide Tuffy with the right home. We require a fenced in yard for children 10 and under, but our recommendations for a fence are inexpensive and will make your life so much easier while providing the pup a safe place to do his business. Please apply on our Web site under Apply to Adopt. A picture of the fencing is on that page. Thanks so much! He is available 12/8/12 and will be at Petco Natick from 11-1 PM and at our shelter on Sunday from 12-3 (if he's not spoken for on Sat). Please fill out an application if you are interested in adopting him. Vickie is a very sweet, affectionate dog who is very friendly and happy. She is Beagle sized, but has some markings like Australian Shepherd or Catahoula. She was originally an unclaimed stray. She walks well on leash, and rides well in cars. She has been at an Indiana shelter for awhile waiting to come. We think she would be great with kids. Her tail never stops wagging. She likes to take walks, and play with her toys, and other dogs. She likes to play 'tug'. If you are interested in this dog, please express your interest by email (if you have an application already on file) or by filling out the online application under Apply to Adopt. It only takes five minutes to fill out and it helps us to speed the adoption process. There is no obligation to adopt until you meet the dog. The application gives us a nice picture of who you are and helps us to make the right match. Once you fill out the application you can apply it to other dogs as well. Ziggy is an adorable 12 lb. puppy who dances and prances and plays. He doesn't know he's in a shelter. He was turned in by his owner because they said he needs too much attention. He is a tiny puppy who just wants to play. If you are interested in this dog, please express your interest by email (if you have an application already on file) or by filling out the online application under Apply to Adopt. It only takes five minutes to fill out and it helps us to speed the adoption process. It doesn't say pit bull on his paperwork, so there is no danger of insurance cancellation. 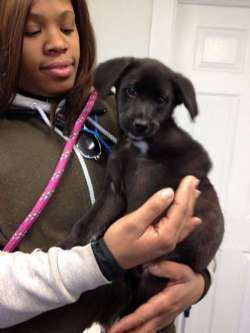 We can met this adorable puppy at our shelter on Saturday, December 15th from 12-3 PM. We are located at 604 Boston Post Road in Sudbury (Rt. 20). There is no obligation to adopt until you meet the dog. The application gives us a nice picture of who you are and helps us to make the right match. Once you fill out the application you can apply it to other dogs as well. Ziggy is available as of 12/14/12.